On the 8th (Fri), explore and take pictures at Estrada Da Graciosa, stroll through Parque Barigui, and then examine the collection at The Automobile Museum. For maps, ratings, more things to do, and other tourist information, use the Curitiba online itinerary maker . 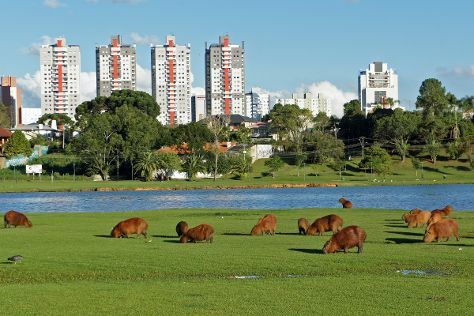 Londrina to Curitiba is an approximately 1.5-hour flight. You can also drive; or take a bus. Expect little chillier temperatures when traveling from Londrina in February; daily highs in Curitiba reach 30°C and lows reach 20°C. Finish up your sightseeing early on the 8th (Fri) so you can travel to Caioba. Start off your visit on the 9th (Sat): kick back and relax at Brava Beach and then kick back and relax at Mansa Beach. Plan my day in Caioba using traveler tips and tourist information provided by Inspirock. Traveling by car from Curitiba to Caioba takes 2 hours. Traveling from Curitiba in February, things will get a bit warmer in Caioba: highs are around 36°C and lows about 26°C. Finish your sightseeing early on the 9th (Sat) so you can travel to Pontal do Parana. Pontal do Paraná is a municipality in the state of Paraná in the Southern Region of Brazil.Pontal do Paraná is home to the Center for Marine Studies, Federal University of Paraná. Kick off your visit on the 10th (Sun): take an in-depth tour of Memorial of the Municiapality of Pontal do Parana, then get outside with Balneario Costa Azul, and then kick back and relax at Balneario Gaivotas. To see traveler tips, maps, other places to visit, and tourist information, use the Pontal do Parana vacation planner . Pontal do Parana is just a short distance from Caioba. In February, daily temperatures in Pontal do Parana can reach 36°C, while at night they dip to 26°C. Finish up your sightseeing early on the 10th (Sun) so you can travel to Guaratuba. With golden sands, bright blue sea, and mountains framing the picturesque city of Guaratuba, it seems as though it were made for tourists. Start off your visit on the 11th (Mon): enjoy the sand and surf at Brejatuba Beach, make a trip to Morro do Brejatuba, and then kick back and relax at Guaratuba Beach (Central). For reviews, more things to do, ratings, and more tourist information, go to the Guaratuba road trip tool . You can drive from Pontal do Parana to Guaratuba in 1.5 hours. Expect a daytime high around 36°C in February, and nighttime lows around 26°C. Finish your sightseeing early on the 11th (Mon) to allow enough time to travel to Itapoa. Itapoá is a municipality in the northern part of the state of Santa Catarina, Brazil. On the 12th (Tue), stroll through Barra Do Sai Beach and then stroll through Itapoa Beach. To find traveler tips, maps, and tourist information, read Itapoa itinerary builder . Traveling by car from Guaratuba to Itapoa takes an hour. In February, daily temperatures in Itapoa can reach 36°C, while at night they dip to 26°C. Wrap up your sightseeing on the 12th (Tue) to allow time to travel to Ilha do Mel. Situated in the mouth of the Baia de Paranagua, scenic and tranquil Ilha do Mel boasts many natural and man-made attractions. On the 13th (Wed), visit a coastal fixture at Farol das Conchas, then stroll through Fora Beach, and then kick back and relax at Farol Beach. For reviews, other places to visit, traveler tips, and tourist information, use the Ilha do Mel trip builder website . Explore your travel options from Itapoa to Ilha do Mel with the Route module. In February, daily temperatures in Ilha do Mel can reach 36°C, while at night they dip to 26°C. Finish your sightseeing early on the 13th (Wed) so you can travel back home.